Textile home décor industry is fast transforming into an “IT” industry. Once dominated by independent interior designers and big box retailers, the market for textile home décor has witnessed proliferation of a number of startups. Online crowdsourcing and affordable outsourcing are key trends catching on in the market, wherein online provisions of style boards & design ideas, and hiring designers at affordable costs have become convenient. These trends are primarily driven by the marketplace attributes such as new online business models, price transparency, and standardization. In a bid to help consumers in making effective decisions apropos purchases of home textiles, style profiling has gained utmost importance by articulating preferences and narrowing down scope of choices of consumers. Several entrepreneurs, aware of challenges involved in product marketing, are tailoring their merchandizing strategies to organize their products on the basis of theme, instead of category. The global textile home décor market involves a long supply chain, which in turn adds to cost of the final product. Therefore, companies are focusing on remodeling the supply chain and trimming the price tags, by working directly with manufacturers. Transparency Market Research, in its recent research report, has envisaged the global textile home décor market to register a splendid expansion during the period 2018 to 2027. Global sales of textiles home décor are projected to bring in revenues over US$ 185,000 Mn by 2027-end. Prevailing consumer confidence and broader economic trends directly impact demand for home décor textiles. With key economies across the globe making a steady recovery, a steady spike has been observed in consumer confidence over the past couple of years. According to Reserve Bank of India’s December 2017 round of Consumer Confidence Survey (CCS), Households’ current perceptions on the general economic situation improved and edged up towards the neutral level after five quarters of pessimism. According to OECD’s Consumer Confidence Index (CCI), consumer confidence has witnessed a steady growth in the last couple of years. In February 2018, the OECD CCI was at 101.10 (with long term average at 100), signifying a positive perception among consumers on the economy. Positive perception on the entire economy is traditionally linked with increasing activities pertaining to home refurbishment. 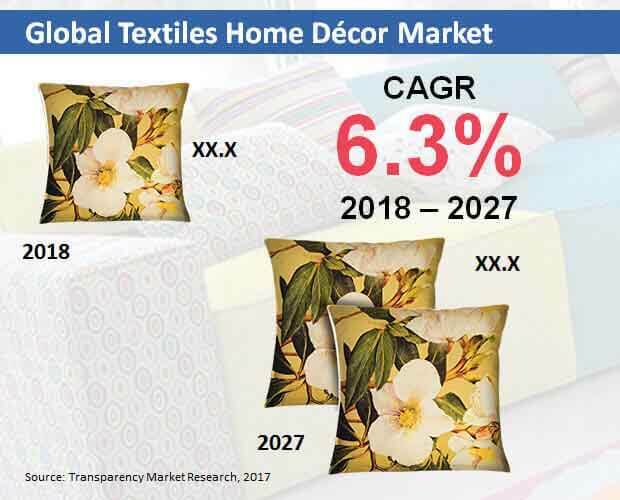 Sustained period of greater consumer confidence can be a key future growth determinant for the global home décor textiles market. Demand for bed linen is expected to rise at a brisk pace across the globe, driven by a steady stream of opportunities emerging in both developing and developed markets. Sensing profitability of bed linen, key manufacturers are concentrating on consolidating their market position. For instance, Boutique Living, a bed linen brand by Indo Count Retail Ventures P. Ltd. (ICRVL) is planning to increase its focus on the bed linen segment. A key challenge for stakeholders in this segment is the highly fragmented presence of unorganized players. In a bid to counter the challenges from the unorganized sector, leading players are focusing on offering entry-level bed linens that are priced attractively. TMR’s report has profiled key participants supporting growth of the global home décor textiles market, which include Kurlon Ltd., Leggett & Platt Inc., Williams-Sonoma, Inc., Ashley Furniture Industries Ltd., Inter IKEA Systems B.V., Mohawk Industries, Inc., Berkshire Hathway Company, and Nitori Holdings Co. Ltd.
An executive summary at the beginning of the report provides a snapshot of the global textile home decor market forecast, including the region-wise outlook coupled with relevant market numbers. The executive summary also offers a forecast on other textile home decor market segments in terms of market share, revenues, and CAGRs. A chapter on overview, which trails the executive summary, provides a concise market introduction which includes a market taxonomy table and a formal definition of “textile home decor”. The overview chapter elucidates key nodes of the global textile home decor market such as supply chain, cost structure, service provider lists, raw material sourcing strategies, and pricing analysis. This chapter also issues a succinct study on the overall market approach of key players partaking in the global textile home decor market, displaying their presence on an intensity map. The report also delivers assessment on the global market for textile home décor through a segmentation analysis in its following chapters. The market has been branched on the basis of product type, distribution channel, application, and region. These market segments have been scrutinized and analyzed based on a comparative study that involves revenues, market share, and Y-o-Y growth through the forecast period. Geographically, the global market for textile home decor has been categorized as North America, Asia-Pacific excluding Japan, Europe, Latin America, Japan, and Middle East & Africa. A chapter provided in the report, which is dedicated to the global textile home décor market’s competition landscape, issues analysis on key players underpinning the market expansion. Imperative information on these market players along with novel strategies adopted by them for staying at the market’s forefront has been delivered in this chapter. Companies included in the report are profiled individually by the report in terms of their product overview, key financials, company overview, and key developments. A SWOT analysis has been offered on each company, providing detailed intelligence on their strengths, weaknesses, opportunities & threats dealt. The chapter on competition landscape is priceless for readers of the report, owing to the provision of a deep understanding of the market players. This concluding chapter of the report is also valuable for new market entrants for better understanding their competitors. Analysts of TMR adhere to a robust research methodology for analyzing the overall market size through historical data, public domain data, and primary responses. Revenues from companies supporting expansion of the global textile home decor market have been benchmarked for ascertaining the market size. Macroeconomic factors such as the industry growth and GDP of regional segments have been considered for envisaging the market size during the forecast period. Historical expansion of end-use industries, performance of the market players and current macroeconomic outlook are also considered for estimating the market trend forecast. Data obtained is then been validated using effective tools by TMR’s analysts for garnering qualitative and quantitative insights on the global textile home decor market.